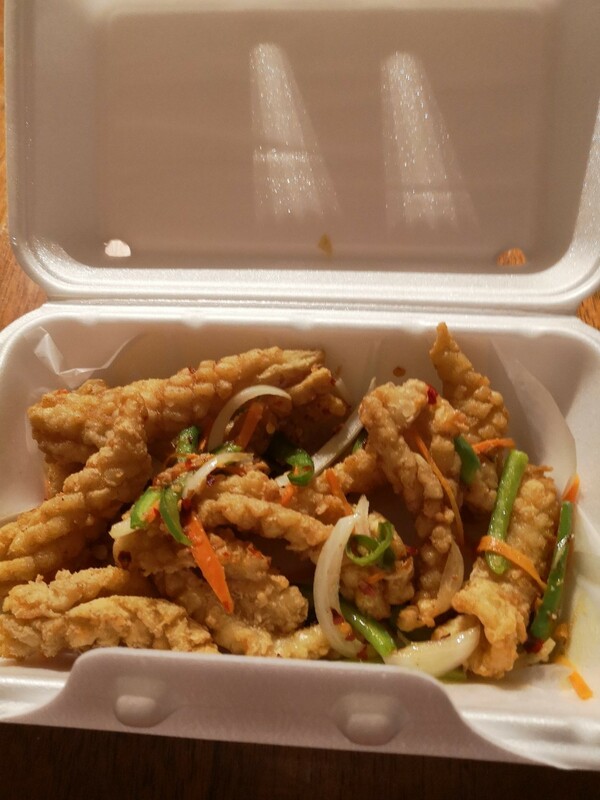 What did you have for a meal today? Discussion in 'Off-Topic Forum' started by Trusteft, Jan 30, 2012. BBQ Chicken Flatbread, and Sweet Tater Fries w/Honey Mustard dip. Enough to take some home! Calliers and Trusteft like this. Trusteft and Calliers like this. 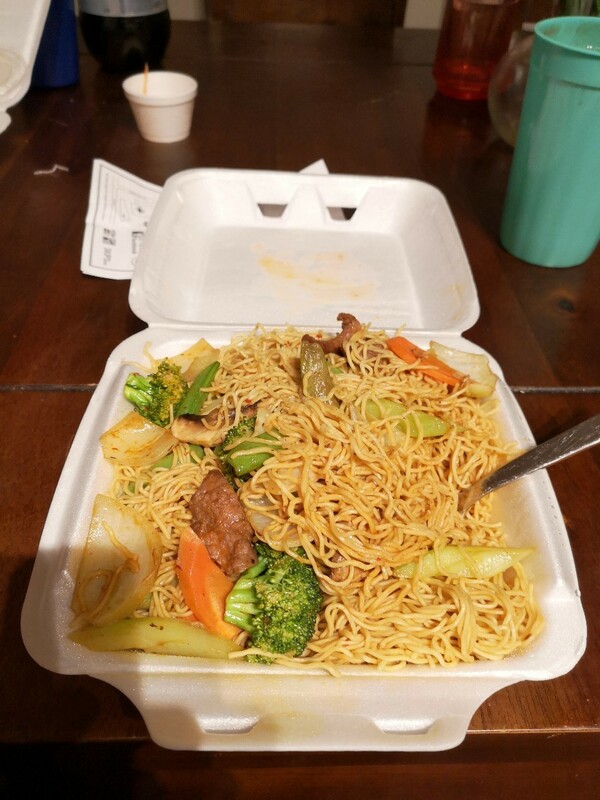 This was really good, soft lo mein noodles with beef and stir fried vegetables in Thai curry sauce. Trusteft, IvanV and Calliers like this. 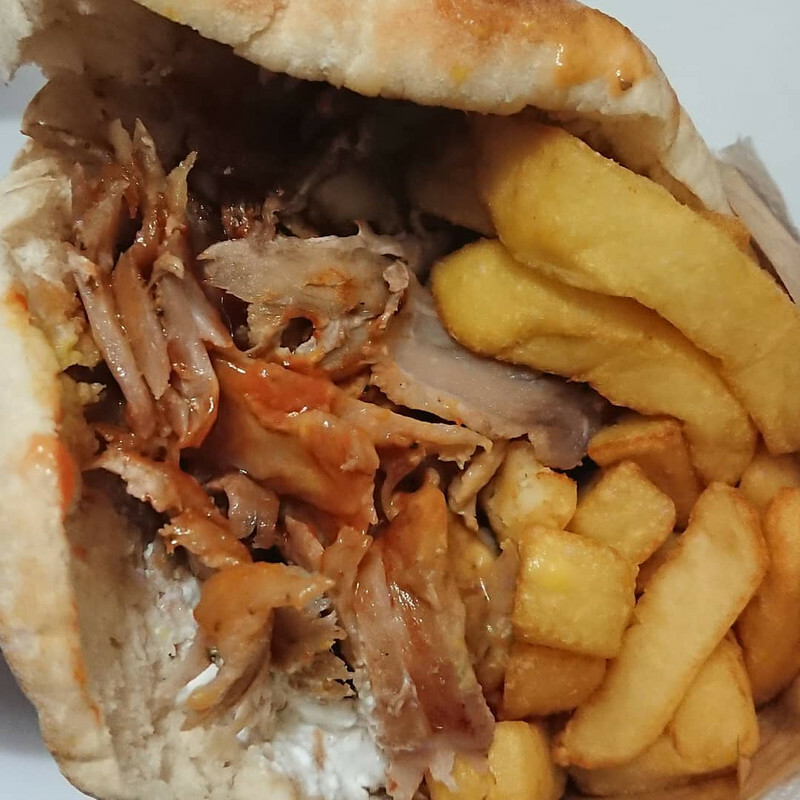 This is a gyros, pork, with fries, spicy cheese spread, ketchup, mustard, all in a "Cyprus" style pita bread. 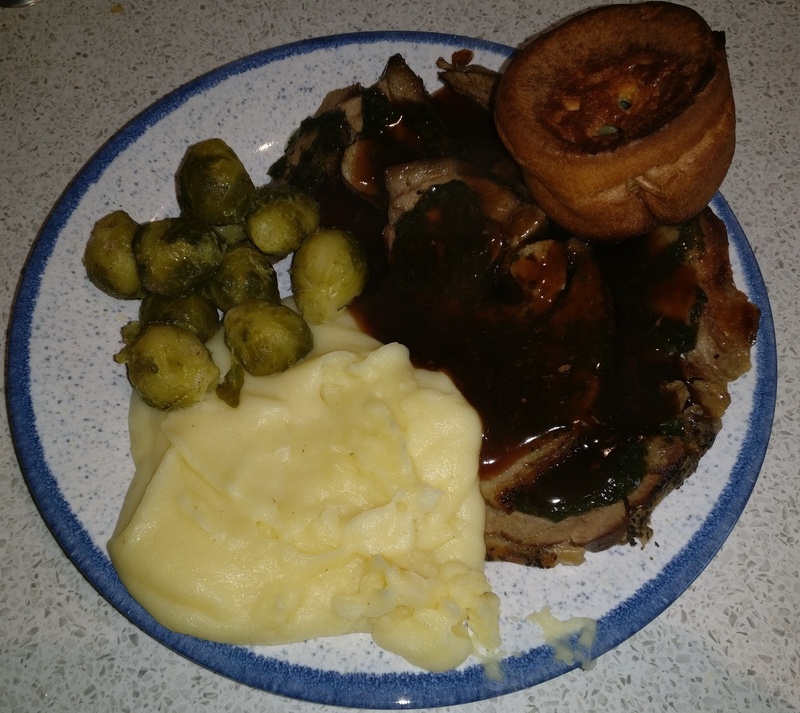 Just had this for dinner. FuNsTeR, Calliers and IvanV like this. IvanV, Trusteft and Calliers like this. 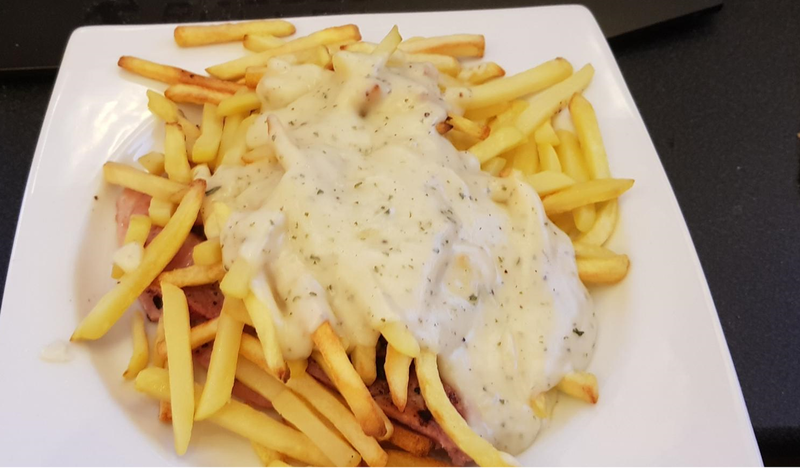 Today, Gammon with French Fries smothered with Parsley sauce..
Minced Pork & Leak Stew. Broccoli and Carats and boiled potatoes..
IvanV, Trusteft, Calliers and 1 other person like this. I actually got this meal totally free this evening. I'm a very regular customer here at Guston's. I ordered the burger with "LOTS OF PINK...but not bloody." Well, it came pretty much well-done. After a couple of bites, I asked the server, a very nice young lady, to show me if she could see any pink at all. Very clearly, there wasn't any to be seen. She offered to have my burger re-made. I declined and she said she'd be happy to have it re-made. I said it wasn't necessary and I would go ahead and eat the one she served. She then said she'd see if the manager would discount it for me. I said that that would be fine if she wanted to do that. Well, in a little while she returned and said the meal was on them since they messed it up. Although I really do prefer a hamburger cooked medium and a little on the side toward rare, this one was OK. When it's cooked the way I like it, it's fabulous!!! I just made these. Delicious. I think first time I link to a video on instagram. No idea if it will work as with youtube. FuNsTeR, Dyre Straits and Trusteft like this. Just today, Keeping it nice and simple.. Sausages and French fries.. I know I have mentioned it before, but one of the food in the UK I miss very much is sausages. Very different taste than any other. IvanV, Calliers and MIG-31 like this. I have been to Greece (quite a while ago now back in 2007) I don't think I have had sausages there.. So I can't compare that.. I have never taken to Bacon in either Greece or Portugal/Spain.. I don't know if it's the cut or how it is cooked.. Same here.. Possibly from when I were young, my dad made a dinner (He can't cook to save his life) and the Mash were that lumpy it kind of put me off mash for a while..
You know, @MIG-31, I've always preferred to have my ketchup on the side when I have fries, just a preference, I don't like to get too much or too little ketchup on just one fry.